David Yates at the premiere of Order of the Phoenix, July 2007. Yates was particularly praised for his transition from television to mainstream cinema; he had not directed a feature film prior to Order of the Phoenix. On review aggregator Rotten Tomatoes the film has an approval rating of 77% based on 247 reviews, with an average rating of 6.88/10. 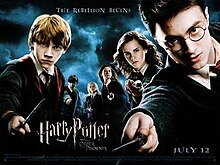 The site's critical consensus reads, "It's not easy to take the longest Harry Potter book and streamline it into the shortest HP movie, but director David Yates does a bang up job of it, creating an Order of the Phoenix that's entertaining and action-packed." On Metacritic, the film has a score of 71 out of 100, based on 37 critics, indicating "generally favourable reviews" On CinemaScore, audiences gave the film an average grade of "A–" on an A+ to F scale. ^ "HARRY POTTER AND THE ORDER OF THE PHOENIX (2007)". AFI Catalog of Feature Films. Retrieved 24 July 2018. ^ a b "Harry Potter and the Order of the Phoenix (2007)". British Film Instirtute. Retrieved 18 October 2017. ^ "'Hollywood Accounting' Losing in the Courts". Techdirt. 8 July 2010. Retrieved 2 January 2015.